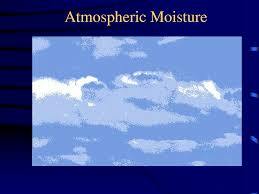 This term paper focus to discuss on Moisture in the Atmosphere. The troposphere is also referred to as the weather sphere. This is a result of the water vapor from the air. After the tropopause, water vapor doesn’t exist from the atmosphere. Figure shows this temperature, pressure, and water vapor values for each one of the layers of the atmosphere. Here briefly discuss on Measurement of Water in the Air and Finding Relative Humidity.